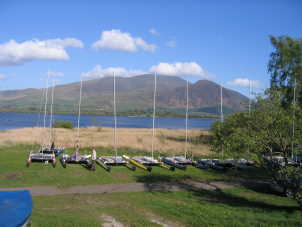 Bassenthwaite SC, a favourite venue for the Catapult fleet, hosted our Northern Championships over the May Day bank holiday weekend (with the results also counting to to the 2009 Travelling Trophy. 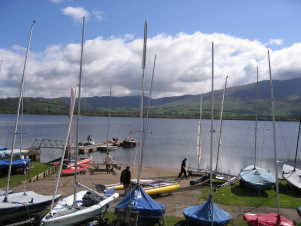 Force 3 breezes on Saturday provided excellent, competitive sailing. Justin Evans led the fleet for the first lap of Race 2 chased by Gareth and Dave. Gareth grabbed the lead up the next beat and hung onto it for the rest of the race while a close fought battle developed for second place. Alastair Forrest went left up the beat gaining several places to take second. Stuart and Cliff broke away from the chasing pack to close on Alastair. Stuart overtook on the last reach, but Alastair retaliated on the run. This prompted a luffing match, but both had to keep an eye on Cliff in case he sneaked through. Stuart was narrowly ahead as they rounded up for the last short beat to the line and crossed just ahead of Alastair and Cliff. Stuart Ede on the way to winning the Catapult Northerns. Sunday dawned bright but windy with lots of prolonged strong gusts. An RS400 checking the line at the wrong time stuffed several of the fleet at the start of Race 3. Stuart squeezed between him and the committee boat to take the lead from Dave and Justin. Justin proceeded to dog Stuart�s footsteps all the way to the finish, while leadership of the chasing pack changed many times before Cliff took third place from George Evans. Stuart was forced to deny rumours that he had slipped a fiver to the RS400 helm. Cliff was first to the windward mark in Race 4 followed by Alastair. Gareth fought his way through the fleet to challenge them and briefly took the lead until his outhaul snapped. There was much place changing between the three of them, but Cliff crossed the finishing line just ahead of Gareth and Alastair, while George came fourth. Stuart got away first in Race 5 and progressively lengthened his lead, while Gareth and Cliff battled for second. On two successive laps they were so absorbed in their duel that they went well above the rhumb line on the broad reach, while Alastair saw that there was better pressure going lower and further from the shore, and went through to lead each time. As they rounded the last leeward mark, it was Alastair narrowly ahead from Cliff and Gareth. Gareth was able to tack inside Cliff to challenge Alastair, and the gun went in very quick succession. The Race Officer awarded a dead heat to Alastair and Gareth with Cliff just fractionally behind. Going into the last race, Stuart was ahead of Gareth on points with Cliff lying third. Gareth could still win the event if he came first with his dad well down the fleet. Stuart led for the first two laps, but his recurring nightmare was realised yet again as Gareth reeled him in and then reached past him on the last lap. Fortunately for Stuart he had enough of a lead over Cliff to hold onto second place comfortably, so he was still able to claim the Northern Trophy. Footnote: Nigel got carried away when duelling with friend Justin on the reach to the gybe mark in Race 6. He managed to ram Justin as they rounded the mark, and in his keenness to get back into the fray he went into an immediate penalty turn. 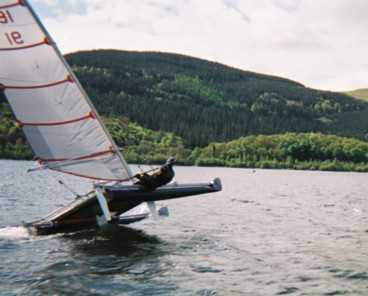 Alas, he promptly capsized and became probably the first Catapult helm to do his 360 penalty in the vertical plane!